Surf two waves on an outrigger canoe! 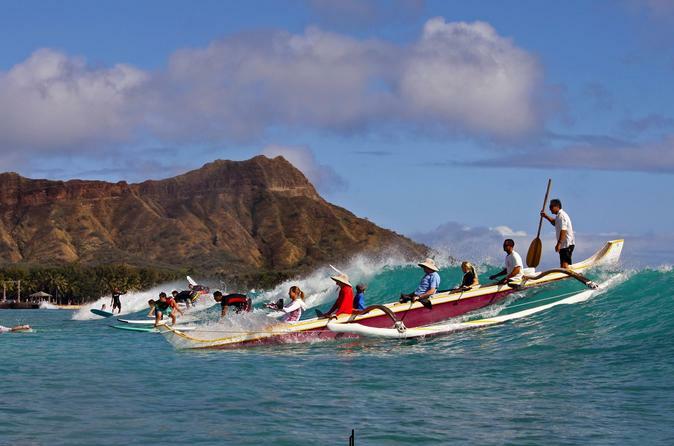 Canoe surfing was once a sport reserved solely for Hawaiian royalty--but now everyone can experience this thrilling ride! The outrigger canoe is one of the only ocean vessels that does not require life jackets for riders, as it is very safe. All abilities are welcome, ages 5+. We guarantee to catch two waves, and the duration time vary depending on the surf condition. Little ones and non-swimmers are welcome. You must have at least 4 people to participate, and up to 6 passenger can fit in the Outrigger Canoe. Only 4 passenger will be paddling. If you don't have the minimum requirement of 4 people to participate, just sign up for 4 and we will add our Waikiki Beachboys to paddle with you. (Please note exactly how many people are signing up when you have less than 4). Our certified canoe captain will steer the canoe. Check in at least 15 minutes prior to the scheduled time. Bathroom is located at the Duke's Waikiki restaurant. Be sure to bring your own towel and sunscreen. Bring your own change of clothes. No shower rooms available. Bring cash or credit card for additional services such as Photo/Video services. Don't forget to ask for the photo/video services (with additional charge) when you check in.